During the summer of 1998 Vanguard Records released a new compact disc (CD) entitled Blues from the Delta. Composed of 20 songs written and performed by the legendary Skip James as early as 1931 - but most of the songs date from the mid to late 1960s. This collection has been painstakingly remastered in the studio and includes two previously unreleased songs. The artwork and notes on the back of the packaging proclaim Skip James as the "Founder of the Bentonia school of Delta blues." Other CDs featuring the work of this Yazoo County bluesman include Skip James - Greatest of the Delta Blues Singers, the Yazoo Records' The Complete Early Recordings of Skip James and 50 Years - Mississippi Blues in Bentonia. Nehemiah Curtis James was born on June 9, 1902 in Yazoo County. Was he born in Bentonia or Yazoo City? His biographer, Stephen Calt, working from hours of taped interviews with Skip, is certain that James was born at the African American Hospital in Yazoo City and raised on the Whitehead plantation near Bentonia. Around 1917 James began to learn the guitar from a popular local entertainer, Henry Stuckey of Satartia. Later he began to study the violin and piano as well. Working as a laborer and musician, Skip got his break by means of a 1931 audition with H. C. Speir, a talent scout for Paramount, at his Jackson music store. This resulted in a trip to Grafton, Wisconsin. The Depression largely destroyed the recording industry, and James wandered throughout the South during much of his life. Sick--it would turn out to be cancer--he was “rediscovered” by young blues enthusiasts at a hospital at Tunica in 1964. Within a few weeks, he was performing again, this time at the Newport (RI) Folk Festival. Two years later the English "super group" (with Eric Clapton), recorded a loose rock version of Skip's I'm So Glad, drawing international attention to this Mississippi native. He toured widely throughout the United States (and Europe in 1967), while recording ten albums. He died in 1969 and is buried in Merlon Memorial Park, suburban Philadelphia, Pennsylvania, his gravestone being donated by admirers, including Clapton. Skip James' music provides a classic example of what blues is all about, even though it is somewhat atypical. Singing in a near-falsetto, he usually sounds all alone as he laments the woes of his youth (Hard Luck Child) or his broken marriage (Devil Got My Woman). But a wry sense of humor seems to lurk behind many of the songs (if You Haven't Any Hay, Get on Down the Road). Perhaps due to the influence of his father, a late-in-life pastor, he performs first-rate gospel tunes: Jesus Is a Mighty Good Leader. His complicated guitar solos sound eerily like 1940s field recordings from West Africa, while his stop-and-go piano work seems downright Celtic. His Little Cow and Calf Is Gonna Die Blues (1931) would spawn themes which his peers would explore within a faithful but expanding tradition: Milkcow Blues (Kokomo Arnold, 1934), Milkcow's Calf Blues (Robert Johnson, 1937), and Milkcow Blues Boogie (Elvis Presley, 1954). 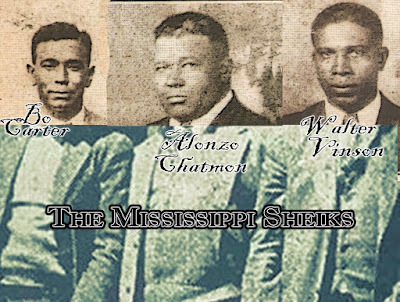 Yazoo County is home to at least nine other recorded blues musicians. In the next two parts of this series, we will briefly consider them. For further reading, consider Robert Palmer's Deep Blues, Paul Trynka's Portrait of the Blues (which includes photos from Yazoo County) and Stephen Calt's I'd Rather Be the Devil: Skip James and the Blues. 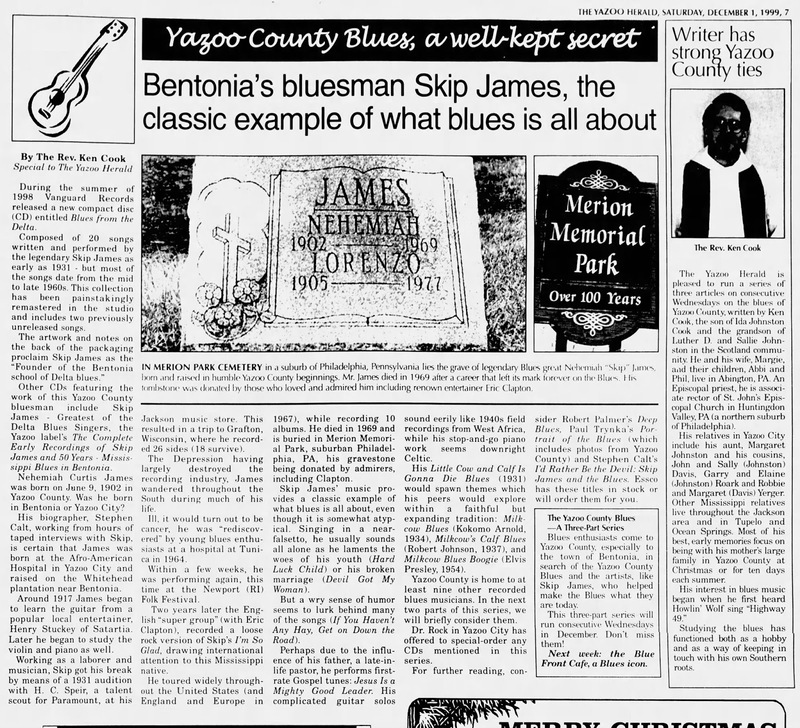 The Yazoo County Blues--A Three-Part Series Blues enthusiasts come to Yazoo County, especially to the town of Bentonia, in search of the Yazoo County Blues and the artists, like Skip James, who helped make the Blues what they are today. This three-part series will run consecutive Wednesdays in December. Don't miss them! Part 2: the Blue Front Cafe, a Blues icon.